Tugu, in Indonesian language, means ‘monument’. 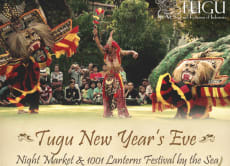 Tugu Hotels are small privately owned and designed collection of luxury art hotels born out of one man’s love and passion for Indonesia’s romantic history. Tugu Hotels’ founder, Anhar Setjadibrata, once upon a time a medical student-turned-lawyer, and now the owner of the biggest collection of fine Indonesian art and cultural antiquities in Indonesia, designed these beautiful boutique museum hotels to house his antiques and to share with the world the romantic stories and legends of ancient kingdoms of Indonesia. Usher in the New Year with a 1930s themed party inspired by the life of artist Walter Spies in Bali. 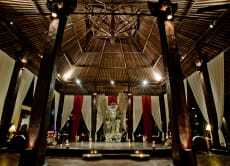 We had a great time, thank you to Hotel Tugu for the hospitality. At first I tried to email the hotel directly 3 times but didn't get an answer then found this voucher online so thought I would buy it and book through voyogin instead. They didn't get back to us straight away so I called them in the morning to check the reservation then I got my confirmation through shortly after. We were very lucky, we got the bed by the ocean, I didn't request this but I did make sure they knew it was my husband's birthday. We are quite fussy with meats and only eat beef, chicken and fish and I let them know and they were very good at taking out the bacon from the salad and changing one of the beef starters which contained duck to the chicken starter. I also requested a birthday cake which they brought out and blindfolded my husband which was lots of fun! The food was fantastic! We had the beef menu and the steaks were so yummy - compliments to the chef! The staff were so friendly and happy to help. It was a great experience, a little pricey but worth it! There were 3 other beds and people arrived at different times, if you are worried about being close to other people, it's fine - you get alot of space and privacy. 10/10 experience. 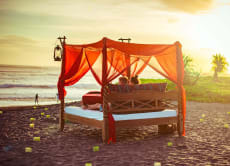 If you are looking for romantic place for surprise your couple, proposal, anniversary, relax time or any special and important day in your life. This place can make you have a wonderful moment that never can't forget.. This was nice and very romantic, overpriced tho unfortunately....the mood and setting is amazing everything was great its just too expensive for what it is I cant justify the cost, probably should be $100 less and they need to state that its not actually on the beach, its infront of the beach on grass. They did a birthday cake for my partner and this was amazing! they are beautiful friendly people who do a great job. The aphrodisiac picnic in bed was lovely but a few things were not as I'd expected. Firstly, the bed is set up on the hotel lawn and other guests of the hotel could still walk through or sit on sun lounges so it wasn't completely private. Two other couples were on the lawn in their own beds, but we were all spread out well and barely noticed one another so that part was done well. The bed itself was more like a hotel day bed and a little rundown but it was set up well and looked pretty. The candles across the lawn looked beautiful and the hotel set up speakers with nice background music playing behind us. The food was lovely. I ordered the chicken menu and emailed ahead to request no seafood. The menu stated the first course would be bococcini & tomato salad but we got a crab & avocado salad and guzpacho soup instead. I had to send the crab back but they happily swapped it for chicken and it was delicious. The chicken and desserts were lovely. I had also emailed ahead requesting a small cake for my partner's birthday. The host confirmed this request via email several weeks before, but there was no cake on the night. The staff were very attentive but stood back and gave us a lot of privacy. Overall it was a lovely night. My partner loved it and it was very romantic, there were just a couple of small things that I felt could be improved but overall we had a great night.